The heartwood of several species of Caesalpinia trees gives a lovely range of strong red dyes, ranging from deep crimsons to pinks. Most brazilwood sold as a dye comes from sappanwood, an Asian tree grown in managed plantations, and Asian brazilwood is not endangered, in contrast to brazilwood from Brazil. We source our brazilwood powder directly from India. Brazilwood comes from several species of Caesalpinia which are flowering trees in the legume family. The leaves are pinnate with several leaflets. 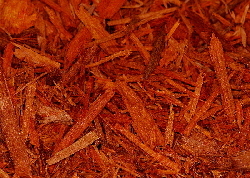 The two species best known to dyers are sappanwood (C. sappan from Asia) and brazilwood (C. echinata from Brazil); both of them produce the red dye brazilin and are called brazilwood. Sappanwood or Indian Brazilwood is common throughout SE Asia and it is the source of commercial brazilwood. It is a small thorny tree that grows 4 to 8 metres tall and about 14 cm in diameter. After the tree is coppiced, it sprouts from the stump. It is then coppiced and harvested every 6 to 8 years, to allow the heartwood to become fully developed in the branches that will be harvested. The species from Brazil, C. echinata, is often called Pernambuco and sometimes referred to as the music tree because its wood is used for violin bows. C. echinata is now listed as an endangered species by the IUCN and listed as a protected species under CITES. Our brazilwood powder is sappanwood which is not a protected species under CITES. The word Brazil (Brasil in Portuguese) comes from the Spanish ‘brasa’ (and old French ‘braise’), meaning embers or glowing coals, from the colour of brazilwood. Brazilwood was first mentioned as a dye in 1321, sourced from the East Indies and India and obtained from sappanwood trees. This red dye was in high demand throughout the Renaissance; it was traded in powder form and it was difficult to obtain. In Medieval times, only sappanwood was available in Europe. However, in 1500 the Portuguese landed in South America and found that brazilwood trees grew in abundance along the coast. This tree was of such economic importance that the Portuguese eventually named the country after the trees found there. Brazil is the only country in the world named after a natural dye. Brazilwood became a popular dye and the Portuguese had a monopoly on this profitable trade. Other nations tried to smuggle it and ships loaded with brazilwood were favourite targets of sea pirates. In the 18th century, exports collapsed due to over exploitation. The brazilwood and logwood trees are closely related plants. The colours of fibre dyed with different wood dyes go very well together; silk dyed with brazilwood looks particularly striking next to silk dyed with logwood. 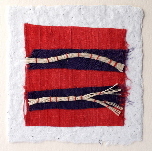 In this design the red is from brazilwood, whilst the purple is from logwood. The chemical structure of the dyes brazilin in brazilwood and haematoxylin in logwood are very similar, but brazilin has one less hydroxyl group (bottom left)..